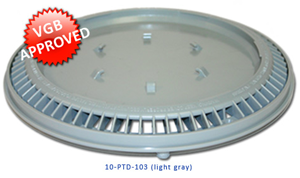 Simply apply any finish or tile directly on top of the patented PebbleTop drain covers to greatly enhance the natural beauty of your pool. 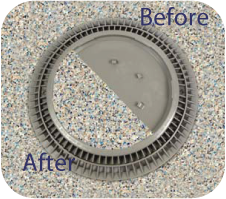 Both the PebbleTop drain covers and Standard Anti-Vortex drain covers have gradual slopes that virtually eliminate automatic cleaner hang-ups. PebbleTop's Texture Lock Hooks keep the finish secured to the drain. To learn more, please visit or Color Match PebbleTop webpage or email your Export Manager.